This unit is now named “Elena” after Elena Persichilli (1940-2016), the beloved mother of the Virtual Telescope founder. She always supported his interests in astronomy since he was a child. The Planevawe 17″-f/6.8 (432/2939 mm) Corrected Dall-Kirkham Astrograph telescope. The main instrument available at the Virtual Telescope is a state-of-the-art Planewave 17″ – f/6.8 (432/2939 mm) Corrected Dall-Kirkham Astrograph telescope. It offers a large corrected field of view, to provide an amazing image quality with large CCD. The OTA consists in a carbon fiber truss, giving a perfect stability against thermal variations. The tube is installed on a Paramount ME robotic mount, the best hardware of this kind available in the world, while as for the detector a SBIG STL-6303E research grade CCD camera is used. A filter wheel offers the following filters by Baader Planetarium: LRGB (for color imaging) and H-alpha (bandwidth: 7nm), OIII (bandwidth: 8.5nm) and SII (bandwidth: 8.5nm) for narrowband imaging. Unfiltered images are also possible, to offer the maximum amount of light for extremely faint objects. The image scale is of 0.63″/pixel, while the mean on site seeing is of 1.8″: high resolution images of deep sky objects are well possible. The field of view (FOV) is of 32.3 x 21.6 arcminutes. The large aperture make possible very deep imaging, useful to detect really faint objects, like small asteroids or faint variable stars. The period error is of about 1″ peak-to-peak, so unguided exposures are easily possible at full resolution with integration time of five minutes or so. This is very important for survey works, where saving the time otherwise needed to look for a suitable guiding star means more observing and discovering chances. The pointing accuracy shows a better than 9″ RMS all-sky error. The whole system is controlled by the TheSkyX suite, with TPoint and Camera add-ons. 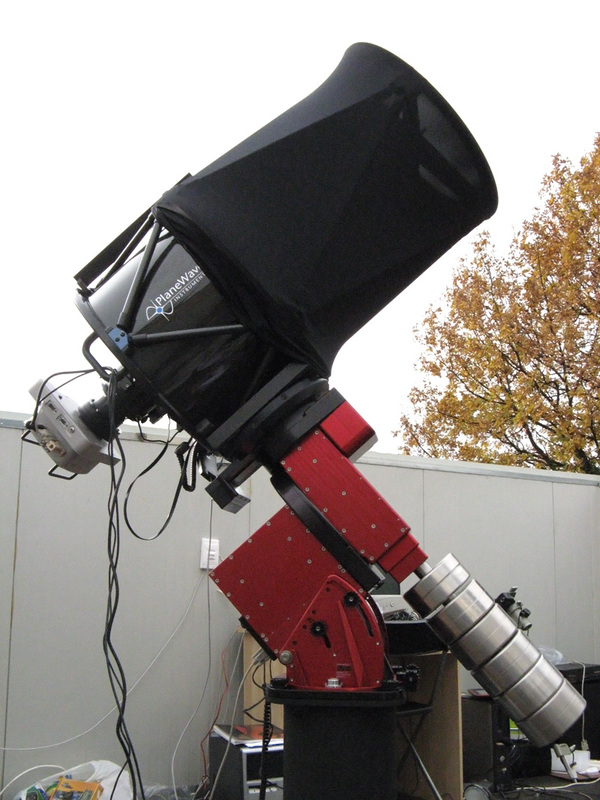 Some applications: the large, corrected FOV makes this unit unmatched for breathtaking images, as well has large objects imaging (like bright comets, galaxies and nebulae), while the large aperture makes possible good time-resolved photometry on stars fainter than mag. 17 (!) and astrometry of objects fainter than mag 20.5. This instrument is fully accessible remotely via the Internet upon request. If you are interested, please check the “Your TeleScope!” section.